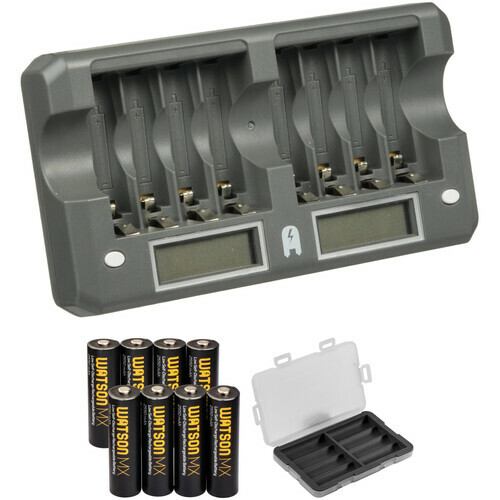 This kit from B&H consists of a Watson 8-Bay Rapid Charger for AA / AAA NiMH or NiCd Rechargeable Batteries with eight 2550mAh Watson MX AA NiMH Low Discharge Rechargeable Batteries. Charging time is 3.6-4.6 hr. Eight individual LCD indicators give the charging status for each battery. The charger's intelligent microprocessor doles out the full charge to each battery while preventing overcharging. The Safety Timer with Automatic Timer Shut-Off senses when batteries are fully charged and ceases charging. Automatic Charge Current Selection chooses the optimal current for the included NiMH batteries, each of which has a capacity of 2550mAh and an output voltage of 1.2V. Reverse Polarity Protection and Alkaline and Bad Battery Protection safeguard the charger and batteries against damage when batteries are installed improperly. The discharge function enables you to refresh batteries before charging. The charger is powered by an included external AC adapter with switching 100-240V power for worldwide use, or by the supplied DC adapter for use in your car. The batteries can be charged up to 1,000 times and are mercury- and cadmium-free. The kit also includes two plastic Watson battery cases that each hold up to 4 AA or AAA batteries in dedicated slots. The case has an extremely compact form factor for easy storage in your pocket or a small compartment in your gear bag. The case has a snap closure and features an attachment point for connecting a second identical case, which could in turn be connected to another to create a chain, giving you an easy expansion option for storing more batteries. The Watson 8-Bay Rapid Charger for AA / AAA NiMH or NiCd Rechargeable Batteries charges up to 8 AA or AAA size nickel-metal hydride or nickel-cadmium rechargeable batteries. Charging time ranges from 3.6-4.6 hr for AA batteries, and 1.6-2 hr for AAA's. Eight individual LCD indicators give the charging status for each battery. Patented technology permits the charging of different sizes and types of battery simultaneously--charge a AA with a AAA, or an NiMH with an NiCd. The charger's intelligent microprocessor doles out the full charge to each battery while preventing overcharging, thanks to Delta Voltage Protection. The Safety Timer with Automatic Timer Shut-Off senses when batteries are fully charged and ceases charging. Automatic Charge Current Selection automatically chooses the optimal current for the batteries you're charging. Reverse Polarity Protection and Alkaline and Bad Battery Protection safeguard the charger and your batteries against damage when batteries are installed improperly. There's also a discharge function, allowing you to refresh the batteries prior to charging. The charger features an icon that shifts up and down during discharging, and stops shifting when discharge is complete. This icon also displays battery capacity while charging. The full-battery icon lights up when the batteries are fully charged. A flashing full-battery icon indicates an abnormality, such as the presence of a bad or alkaline battery, and at this point the charger will cease its operation. The charger is powered by an included external AC adapter with switching 100-240V power for worldwide use, or by the 12-24V DC cord which can plug into your car's cigarette lighter for charging on-the-go. Charges up to 8 AA or AAA size nickel-metal hydride or nickel-cadmium rechargeable batteries. Charging time ranges from 3.6-4.6 hr for AA batteries, and 1.6-2 hr for AAA's. Eight individual LCD indicators give the charging status for each battery. Patented technology permits the charging of different sizes and types of battery simultaneously--charge a AA with a AAA, or an NiMH with an NiCd. Intelligent microprocessor doles out the full charge to each battery while preventing overcharging, thanks to Delta Voltage Protection. The Safety Timer with Automatic Timer Shut-Off senses when batteries are fully charged and ceases charging. Automatic Charge Current Selection automatically chooses the optimal current for the batteries you're charging. Reverse Polarity Protection and Alkaline and Bad Battery Protection safeguard the charger and your batteries against damage when batteries are installed improperly. There's also a discharge function, allowing you to refresh the batteries prior to charging. Has an icon that shifts up and down during discharging, and stops shifting when discharge is complete. This icon also displays battery capacity while charging. The full-battery icon lights up when the batteries are fully charged. A flashing full-battery icon indicates an abnormality, such as the presence of a bad or alkaline battery, and at this point the charger will cease its operation. Powered by an included external AC adapter with switching 100-240V power for worldwide use, or by the 12-24V DC cord which can plug into your car's cigarette lighter for charging on-the-go. Power various electronics, including photo equipment, flashlights, gaming devices, and more, with this 8-pack of 1.2V MX AA NiMH Batteries from Watson. The Japanese-made cells come pre-charged and ready for use with a capacity of 2550mAh, making them ideal for use in high-drain devices. Thanks to their very low self-discharge rate, they are capable of retaining up to 85% of their capacity after 1 year in storage. The batteries can be recharged up to 500 times before their usable capacity starts to diminish. Additionally, they are durable enough to function in temperatures as low as -4°F. This plastic Watson Battery Storage Case holds up to 4 AA or AAA batteries in dedicated slots. It has a compact form factor for easy storage in your pocket or a small compartment in your gear bag. The case has a snap closure and features an attachment point for connecting a second identical case, which could in turn be connected to another to create a chain, giving you an easy expansion option for storing more batteries. Box Dimensions (LxWxH) 7.9 x 6.0 x 3.4"
Box Dimensions (LxWxH) 5.984 x 2.756 x 0.551"
8-Bay Rapid Charger Kit with AA MX NiMH Rechargeable Batteries (2550mAh, 8-Pack) is rated 4.8 out of 5 by 25. Rated 4 out of 5 by TheDenialShow from Great This is my 1st recharable battery charger. It seems fairly intuitive but I read the instruction manual which was limited. It seems it has a discharge & recharge capacity & full-charge capacity can take a couple of hours. It seems if you push the button once it will discharge & then recharge but if you push the button twice it will recharge. Love that it says it will stop charging when full. Rated 5 out of 5 by Christopher from For the price, these are priceless. I started off with the Watson 4-AA charger and have moved up to the 8-AA charger... because I use it ALL THE TIME. I still use one-use brand name batteries for flashes, LED light banks, and wireless transmitters and receivers. But, everything else gets the Watsons; i.e., audio recording devices, mics, etc. They help bring down my battery costs... and throw less battery acid into the recycle bin. When I order new Watson AA batteries, I put a mark on them to indicate which batch they are. First group lifecycle = 1; second group = 2. I have up to three group lifecycles going on at a time. Why? Because you want to know which ones are at or near the end of their productive lifecycle. For me, they seem to last about 30 recharges each... After that, they do not hold the charge that well, nor sustain the delivery of power... and they are not supposed to do it. The 30 recharges I get are already value on value of savings. Even at the end of a lifecycle, I can use them for really low-level energy devices (like remote controls). I just recommend knowing when to get rid of them. The charger does make the batteries hot, from time to time. That's how it re-activates the acids in them. I have tried other brands of AA battery rechargers and they all get questionably hot. The only rechargers that do not get batteries hot are like my pro-level camera batteries, but those are way more expensive. For the price, these are priceless. Rated 5 out of 5 by damselvideo from Best charger ever!! I am sooo happy with this charger! Watson 8-Bay Rapid Charger Kit with AA MX NiMH Rechargeable Batteries (2550mAh, 8-Pack) is the best charger I've ever had. It is so nice to be able to discharge older batteries before recharging. Some of my older ones were deemed not good by other chargers but after discharging then recharging I am able to keep using them. I still don't depend on them for important stuff because they don't hold a charge as long when stored but still... saving money by using them. The smart feature that allows you to charge each bay separately saves so much time and allows you to add batteries for charging at any time. I thought the larger size and charging with a cord instead of a flip out pronged 4 bay would be a pain. Turns out it actually allows more freedom in charging. Excellent charger!! Rated 5 out of 5 by Elizabeth the photog. from Works great / does NOT overheat! Seems to be working just perfectly so far! Charge time is typical. The only concern I HAD prior to ordering was the fear of it overheating. I've read too many horror stories. The good news is that after several uses so far, both the unit AND the batteries only get a little warm. Definitely no overheating! The included Watson batteries are a brand I had never heard of, but seem to be just fine for my use (wedding receptions only). And I'm a geek who loves the plastic carrying cases for the batteries. BONUS! Rated 4 out of 5 by Rich Ard from Flash buddy First, the downside: it takes a while to charge the batteries. My habit is to fully charge them after use, then keep them stored until ready to use. The upside is duration. I bought these solely for use in my flash. I recently used them for a birthday party. Using iTTL I shot fairly continuous for about 2 1/2 hours and still had power left in them. When recharging the batteries do get warm, but as is my habit for many things I do, I monitor the charge (meaning if I remember to look I will, else I don't even think about it). Great batteries. Rated 5 out of 5 by surfphoto61 from Get a charge out of life !! My Watson 8 bay charger and the 16 AA batteries (I purchased 8 extra) work just great. The charge time was just a couple of hours and to get 8 at a time was exactly what I was looking for. Sorry Duracell, you're not getting any more of my money !! Rated 5 out of 5 by Ray N. from These seem to be working great I was going through regular batteries at about 15 every 7-8 days. I purchased eight of the Watsons with charger and carrying case. Most days I will need both sets of batteries. My SB 800 can take five so I will try that this week to see how that works compared to using four. Otherwise, this is money in the bank! They recharge faster than I thought and they are numbered, dated and go in the same order every time. I am not sure if that makes a difference but it just seems to make sense to me. Rated 5 out of 5 by Richard H. from Saved a bunch of money with this thing Saved a bunch of money with this thing. It's definitely better than using throw-away AA bats. It stopped working for me but I sent it in for repair and they sent me a new one for free. What is meant by Discharge in 11 hrs in the specs. Does that mean under use, or do they go dead in 11hrs from just sitting in storage in a half day? How does this unit plug into the wall? is there a cable, a flip out 3 prong, or is it one of those brick type units that take up 2 outlets? It's a regular small cable with an adapter at the end. It should not take more than one outlet. A great product.